Celebrity guide dog, Kika and her owner, Amit Patel were treated to a weekend of activities at Calvert Trust Exmoor last month. Wife, Seema arranged the surprise family break, taking up the Trust’s open invitation to come for a weekend after hearing about Amit’s negative experiences since losing his sight five years ago. When London-based Amit suddenly became blind in 2013 after suffering a haemorrhage behind his eyes, he felt shut off, and initially never considered getting a Guide Dog. 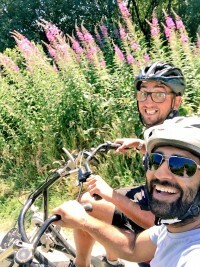 Amit says that being paired with Kika in 2015 changed his world and helped him to regain the confidence to get out & about again. 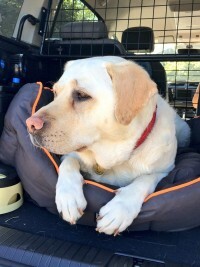 Guide Dog Kika has become quite the celebrity after sharing her GoPro footage across social and mainstream media, helping to highlight attitudes and raise awareness of the issues that people with sight impairments and other disabilities face in their daily lives. 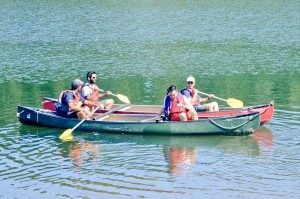 When the Trust witnessed Amit and Kika’s negative experiences, they asked if he would like to bring his family to CTE for a positive, confidence-building, fun-filled weekend, and discover a more inclusive side to travel. Amit’s wife booked them in a few weeks later but kept the trip a surprise. 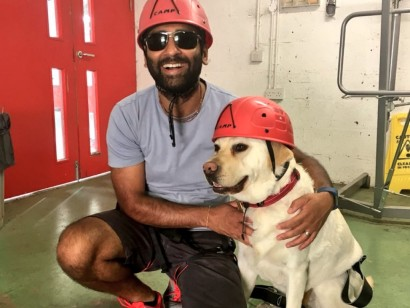 Since being paired with Kika three years ago, Amit has dedicated his life to volunteering for the Guide Dogs for the Blind Association, speaking at their events and undertaking corporate fundraising for the charity. Amit is also a motivational speaker and an independent accessibility consultant and most recently voiced Transport for London’s Priority Seating Week campaign. “It was a struggle losing my sight but now I love my life. Life is absolutely amazing for me now,” says Amit. “It’s more colourful than it was when I had sight.